Back in the day, which is still now for my generation, we called helpful suggestions “tips”. I’m not sure about the evolution of the term “hacks”, I leave that to a linguist to figure out, but I realize as I was teaching my children (and husband, at times) to prepare their own meals, that there are little things that I have learned over the years that make the job easier, i.e. “hacks”. Some things were passed on to me from my mother, some from experience and others are gleaned from reading about cooking. Many of you have tricks of your own, I’m sure! and we’d love to hear about them! 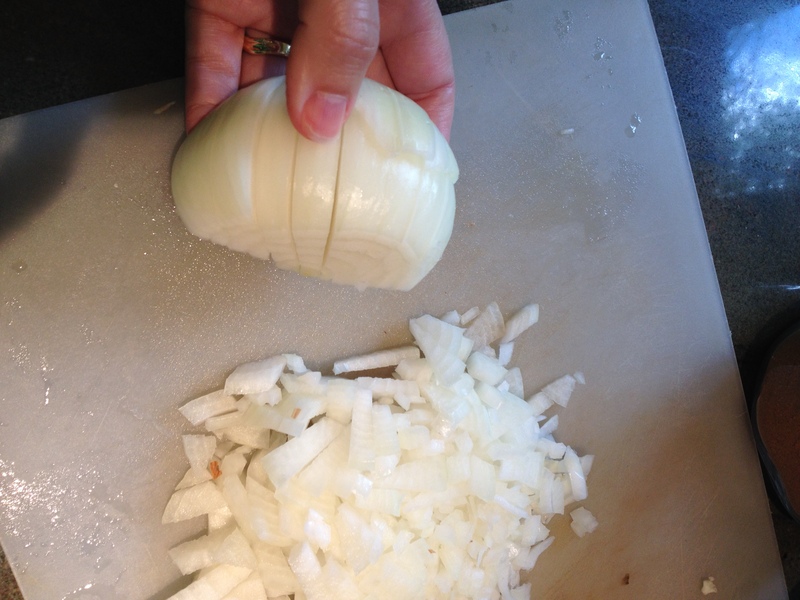 One of the first things my mother taught me, after I had mastered the grilled cheese and putting a roast in the oven while she was at work, was how to chop an onion. If you have watched the movie “Julie and Julia” or an episode of “Chopped“, then you probably think it’s all about lots of knife action! However, my mother taught me this neat trick that keeps me from swinging the blade around. 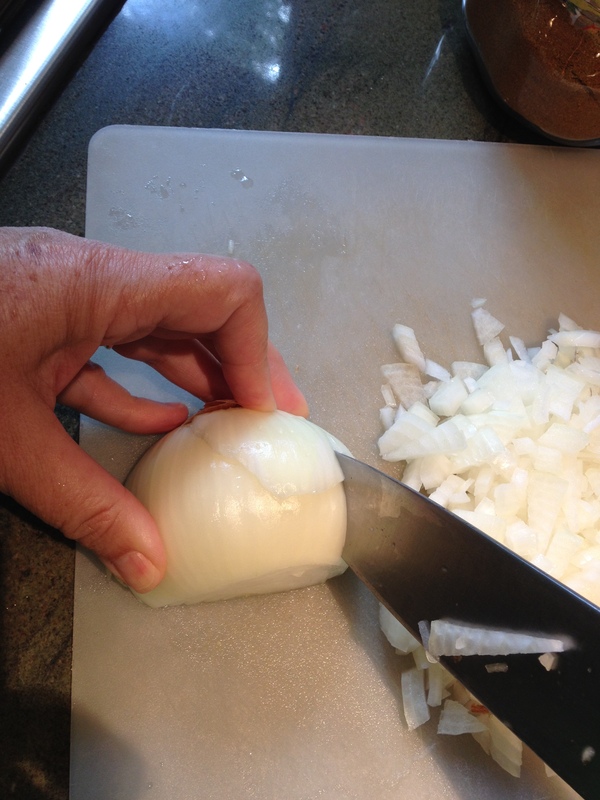 First, peel and cut the onion in half, so it doesn’t roll around. 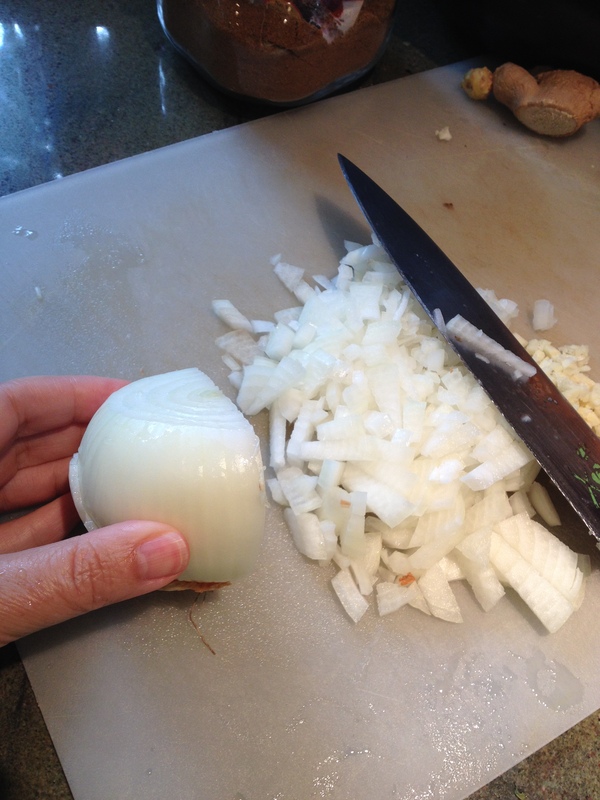 With the flat half on the cutting board, slice into the onion as pictured, without cutting through the end. 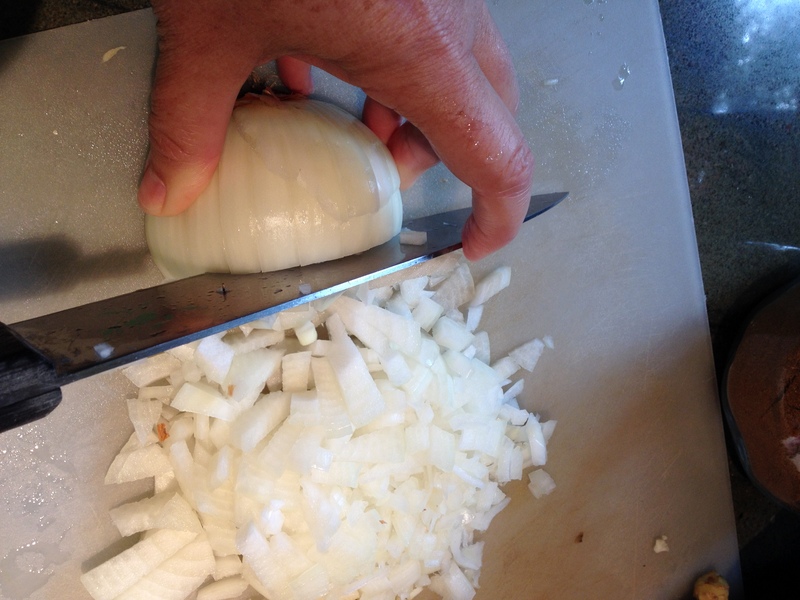 Lastly, slice the onion across. What you get is chopped onion! 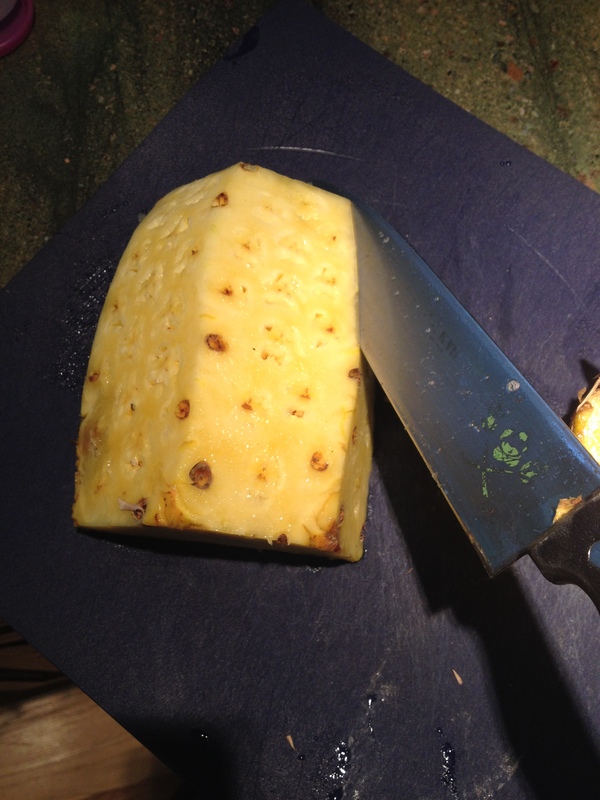 Another nice thing to know, is how to efficiently cut up a pineapple, largely because whole pineapple is less expensive and will keep longer than when you buy it pre-cut. This really doesn’t take long. I usually do it all at once and store it in a container for smoothies and snacks. 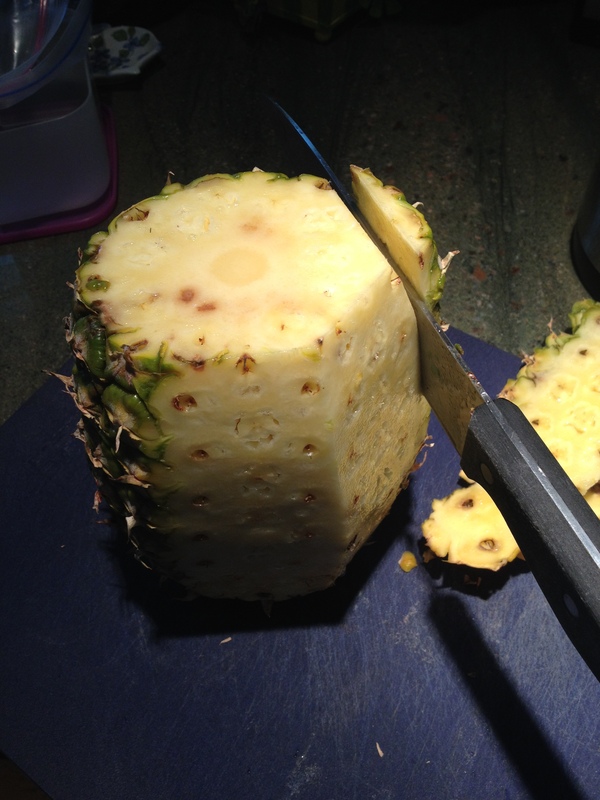 Start with the pineapple on end and cut down the sides. 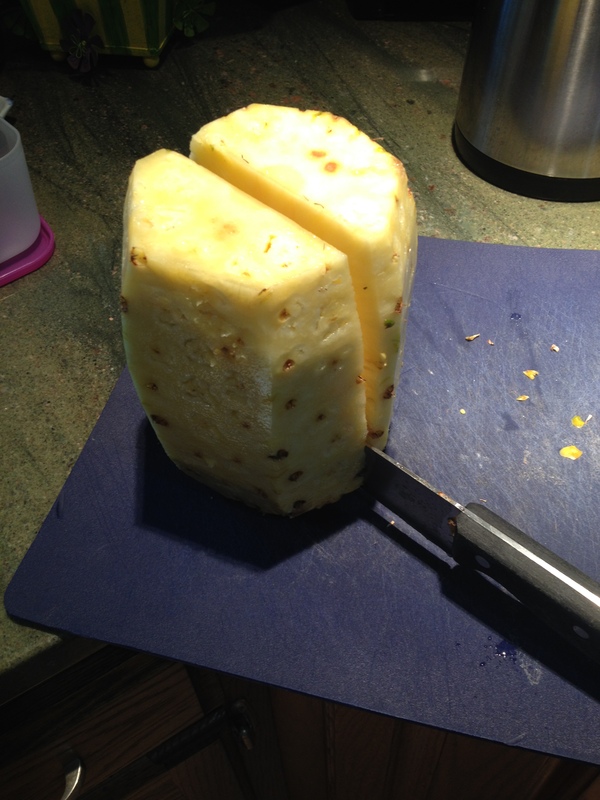 Then slice down the center so you can work with smaller pieces. Now put the flat side down and slice into spears. Lastly, slice the core out on each spear. 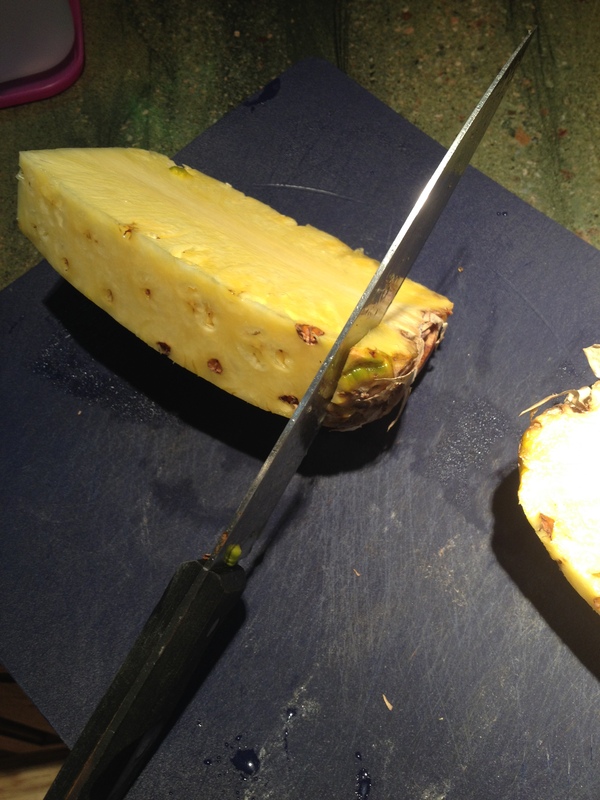 However, if you are going to use these in smoothies, or you don’t mind the tough core, you can skip this part. Now this next hack is one I read about on the web. Don’t ask where. It was one of those mindless “follow the links” sessions and when I read it, I thought “yea, right”! In other words, I never thought it would really work. But then the other day, I decided to try it. 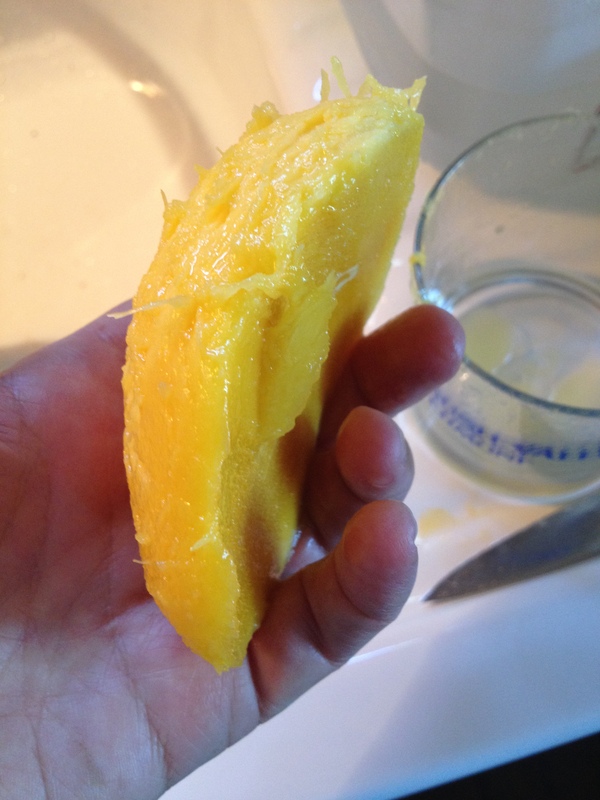 So now I present to you a really neat mango peeling hack. 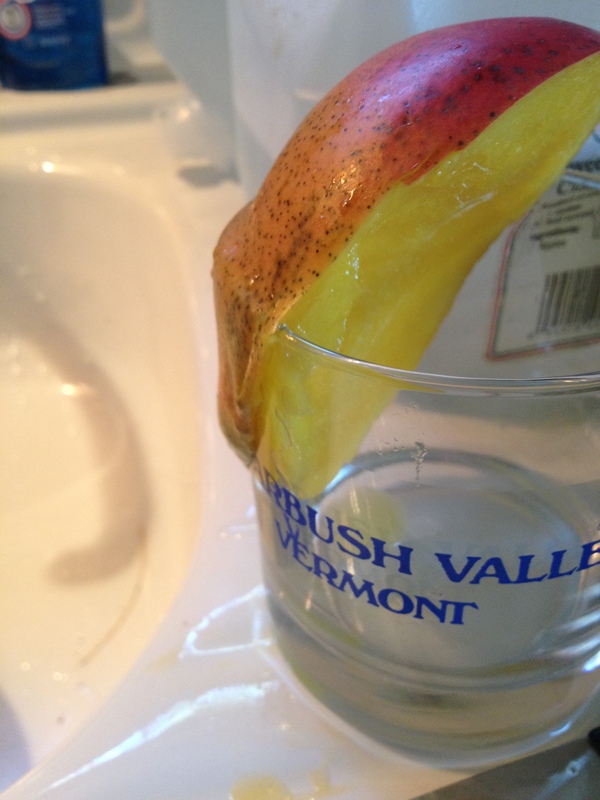 The trick, I think, is a glass that will accommodate the mango. 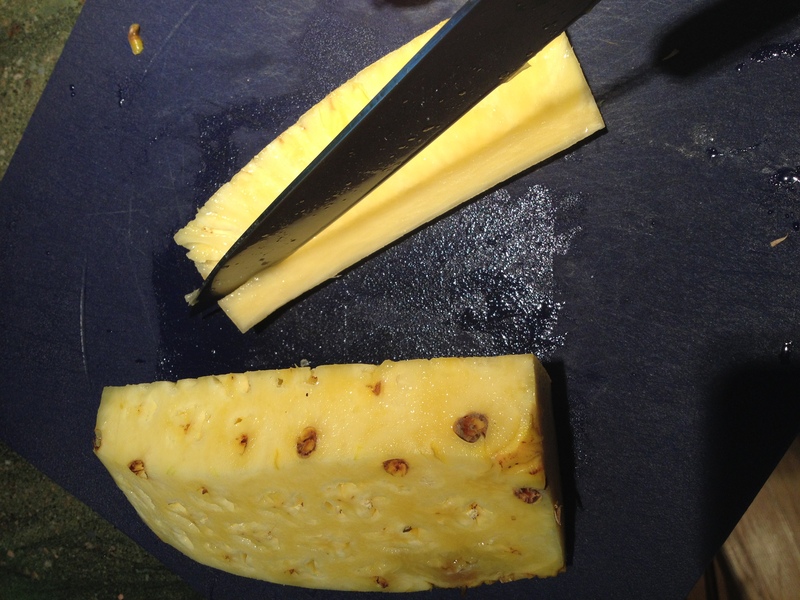 First, slice the mango lengthwise from the stem to the tip. Find a glass wide enough to “fit” the mango. Put the mango against the glass with the peel on the outside and the mango flesh to the inside and use the glass to peel the mango! 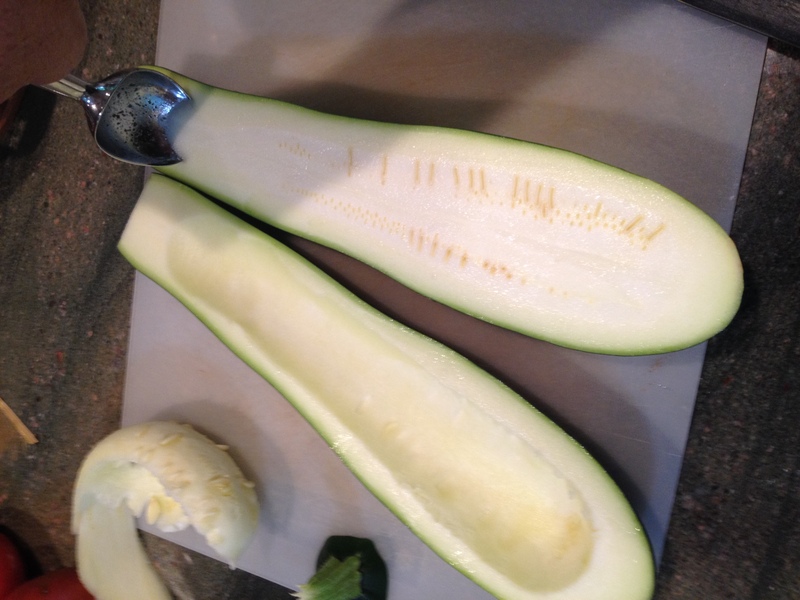 This next one is most helpful this time of year when zucchini are abundant! I really love zucchini, which are very rewarding to grow! Just one or two plants will supply you with your fill of them. Part of the fun of growing your own, is the discovery of the “one that got away” or “the baseball bat”! Yesterday, I had such a zucchini from my garden. One way to deal with such a large one, is to stuff it, which I did. But first, you need to scoop out the flesh. For this, an ice cream scoop works perfectly! See! The final hack, is not really a hack at all. I was harvesting the most beautiful peas earlier in the summer and wondered how many people taste a “real” pea anymore? 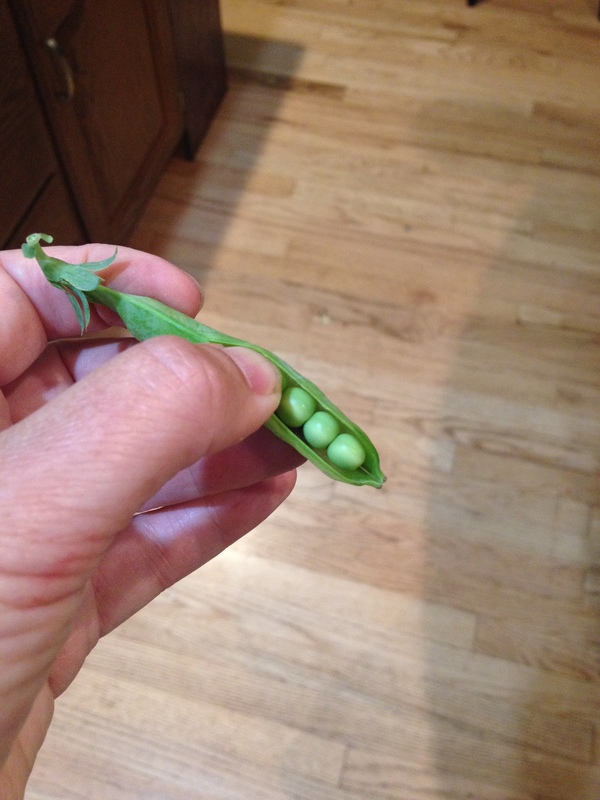 To me, fresh garden peas are like corn on the cob that is picked that day. They are sweet and tender, and taste *nothing* like frozen or canned peas. This is a different vegetable entirely! If you live anywhere near a farm stand where you can get fresh picked peas in the spring, head there next year (it’s too late in most of the USA now). Get them in the pod. When you are choosing them, the pod should be smooth and bright green. They should feel firm with peas inside. Right before you eat them, which should be *that night*, sit down with a couple of bowls. One bowl is for the waste (pods) and the other is for the peas. Press the end and it will pop open. Then run your finger up the inside to get the peas out. I really hope you find fresh peas to practice this tip on! Hint: really fresh peas are excellent RAW!! and children LOVE them!